The Butler ... crafted out of American willow. 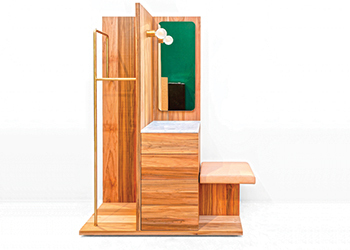 The American Hardwood Export Council (AHEC), the leading international trade association for the American hardwood industry, has partnered with David Chipperfield Architects and e15 to reimagine the hotel wardrobe/suitcase stand and create a bespoke piece of furniture. The Butler, as it is called, allows travellers to unpack their belongings easily and ensure they don’t leave anything behind. London-based David Chipperfield Architects was invited by Wallpaper magazine, to design an alternative to the traditional hotel wardrobe and chest of drawers. They designed the piece which was produced by furniture-makers e15, which manufactures much of the practice’s furniture. e15 pioneered the use of solid wood in its purest form and crafted The Butler out of American willow. In an effort to re-define the in-room experience and make unpacking and re-packing an effortless and elegant experience, Wallpaper commissioned David Chipperfield Architects to design a contemporary take on the valet stand crossed with a sideboard. “This was the first time we worked with American willow, a wood that is much softer than e15’s primary material European oak, but we are very satisfied with the result,” says Jan Philip Holler, senior product designer at e15, who worked on the project. The Butler marks the fifth collaboration between AHEC and Wallpaper’s innovative Handmade exhibition. Dyson has launched a new-technology air purifier fan in the UAE which is said to remove 99.95 per cent of the potentially harmful ultrafine particles, as small as 0.1 microns, from household air. Air purifiers can help capture pollutants, bacteria, viruses, pollen, allergens and odours. However, some purifiers available on the market are inefficient, forcing air through their filters too quickly and allowing these potentially harmful, ultrafine particles to escape back into the room. 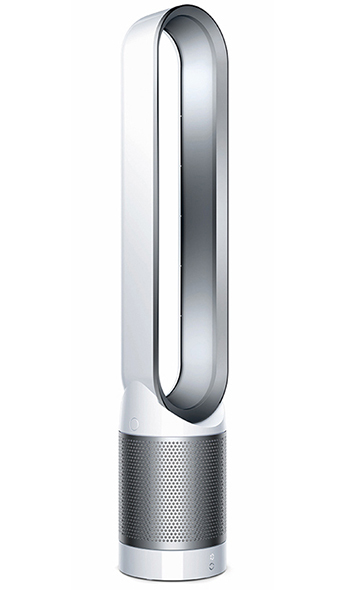 “The Dyson Pure Cool purifier fan uses Dyson’s 360-degree glass Hepa (high-efficiency particulate arresting) filter. This technology captures 99.95 per cent of particles as small as 0.1 microns – trapping them in the filter, and projecting cleaner, purified air around the room evenly and quietly. “There is more to air than meets the eye. Dyson engineers focused on capturing ultrafine particles as small as 0.1 microns, and 450 prototypes later, we developed the Pure Cool purifier. Our unique 360-degree glass Hepa filter is made of 1.1 sq m of constructed borosilicate microfibres, pleated 254 times; it means we can capture 99.95 per cent of particles, as small as PM0.1,” he says. Using powerful Air Multiplier technology and an energy-efficient DC motor, the purifier fan draws in air via a mixed flow impeller. The product is available exclusively through Jumbo Electronics and selected retailers across the UAE. With the Terrace collection, Kohler has designed a comprehensive line for any bathroom space, with a geometric design described as being pure and timeless. The upscale collection of furniture, vanity tops, water closets (WCs) and bidets combine fine materials and finishing with major technological innovation and optimal functionality. On the front of the main cabinet piece, Kohler has combined a lovely lacquer with natural oak. The interior of the main drawer and the accessories drawer is also made of wood, as are the shelves in the storage unit and on the Terrace mirror. The repeated use of materials underscore the collection’s identity and add a unique touch of elegance, says a spokesman for the manufacturer of kitchen and bath plumbing fixtures, furniture and tiles. “Kohler’s ‘à la carte’ lacquer option lets one personalise the cabinet, selecting from 48 gloss or satin shades,” he says. FreeDrain, a major innovation introduced on Terrace, is a new, exclusive patented system that eliminates the usual central drain, enabling the user to stop water outflow with a simple touch of a button at the rear of the vanity top. The system is easy to clean and the streamlined design highlights a refined aesthetic. Terrace optimises available space and makes storage easier: the base unit under the vanity top provides extensive storage capacity, thanks to an accessories drawer and a large drawer, a tall unit with a direct-access vertical niche and four shelves, and a mirror with integral shelves. Equipped with push/pull dampers, the drawer cabinets offer comfort of use, as does the tall storage unit, thanks to its soft-close doors. The Terrace vanity top is available in five dimensions, including an XXL size measuring 1.50 m for both basins (9 cm in depth) and offers a wide rear ledge that is functional and practical for toiletries.